Kathryn G. Flory, M.D. 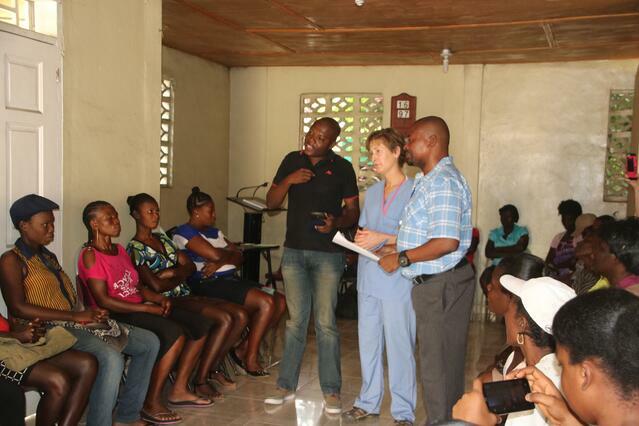 and Leslee J. Jaeger, M.D., both OB/GYNs at North Clinic and physician partners for 27 years, recently traveled to Haiti to volunteer for a medical mission week. While they were working at the hospital performing gynecologic surgeries, a woman presented to the maternity unit with severe hypertension and pre-eclampsia. Pre-eclampsia is the combination of high blood pressure, protein in the urine, and swelling of the lower legs. Pre-eclampsia usually begins after 20 weeks of pregnancy in women whose blood pressure had been normal. Even a slight rise in blood pressure may be a sign of pre-eclampsia. This complication is very common in Haitian women due to their genetic predisposition to hypertension. The high rate of infant and maternal mortality in Haiti is related to this disease. This mother had lost her first child while in labor due to the effects of pre-eclampsia. When it became obvious that her blood pressure could not be controlled with the limited medications that were available, the decision was made to perform a cesarean delivery for the health of the mother and infant. A 3 lb 14 oz girl was delivered that required resuscitation due to her growth restriction and the medications that the mother had received to lower her blood pressure. The new mother was so pleased that the outcome of this pregnancy had been different than the last, that she named the baby after the US nurses that had cared for her and resuscitated the baby. Am I at risk for Pre-eclampsia? Although much less common in the US, pre-eclampsia is on the rise due to the increasing frequency of diabetes, chronic hypertension. and obesity in women. Women are also having babies at an older age, which is another risk factor. If left untreated, pre-eclampsia can lead to serious — even fatal — complications for both you and your baby. The only treatment for pre-eclampsia is delivery of the infant, which often results in a premature infant that requires an extended stay in the hospital. If you have any of these risk factors, please see your physician prior to becoming pregnant so that you can have the healthiest pregnancy possible. Knowing the symptoms of pre-eclampsia is very important for every woman who is pregnant or is planning on becoming pregnant. May is Pre-eclampsia Awareness month, and it's a great time to become aware of this issue and learn the signs and symptoms of this potentially fatal disorder. Looking for more practical advice for your pregnancy? Check out our healthy pregancy guide for more information.